The best thing to do is try and find a nice vintage one which is maybe a little worn around the edges, as these have so much more charm than a spanking new one. Apart from checking out endless charity and thrift stores, the bets place to look is eBay! I have bought two tweeds from there, both in the screen-accurate fine-checked fabric. 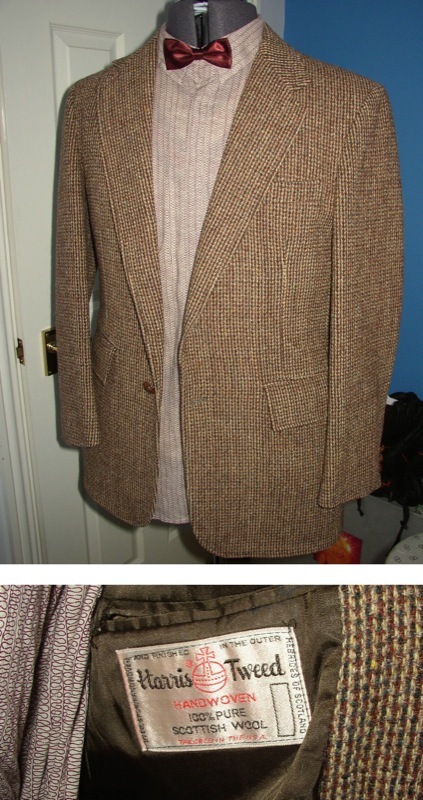 The search criteria I use is as follow: eBay: Men’s Tweed Jacket. You might want to add ‘Harris’ or “Donegal’ to the search if you want to narrow it down a bit, though you may miss the perfect jacket being sold without the name in the title due to a seller’s ignorance. There are often several hundred jackets listed, so it can take a while to trawl through them all to find one in the right fabric; with the right cut; and importantly, your size! 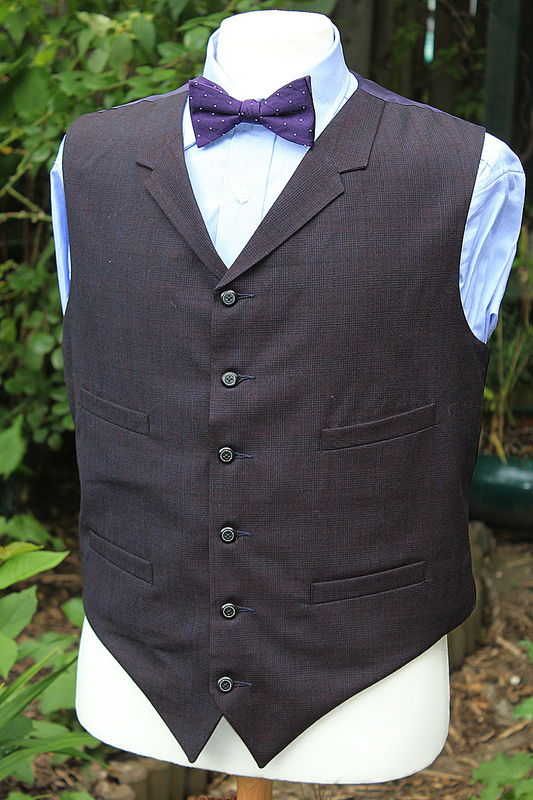 If you don’t want the hassle of trawling eBay, you can cut straight to the chase by ordering a pre-made, or made-to-measure jacket. 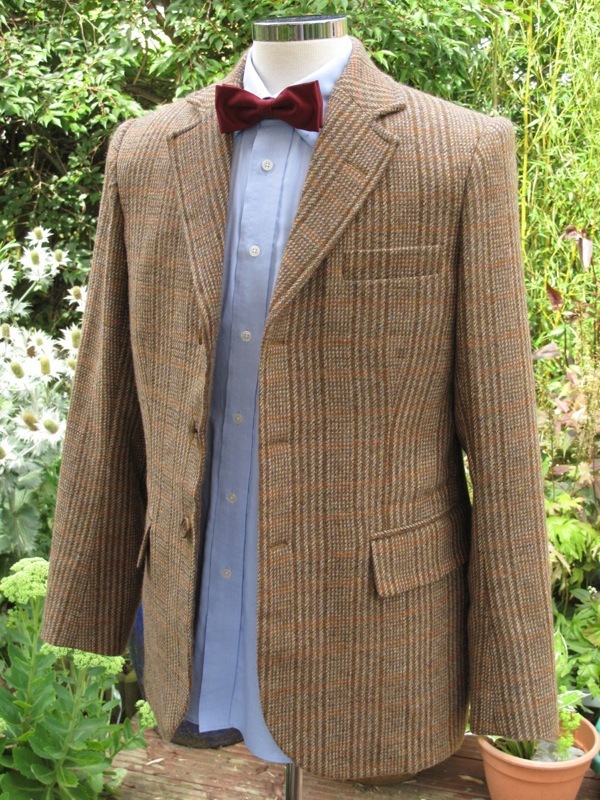 Montague Jeffery based in Northampton were given an official license to make replicas of the Matt Smith jacket, though they have not publicised it widely. They arranged a reweave of the Mackenzie Dogtooth, and make jackets to a range of set sizes (38, 42 and 44 chest). They can be order directly or online through The Doctor Who Shop for £450, who also do not really give the jacket the prominence it probably deserves. If you want to go down the houndstooth option for your jacket, you could order one made-to-measure from Magnoli Cothiers. 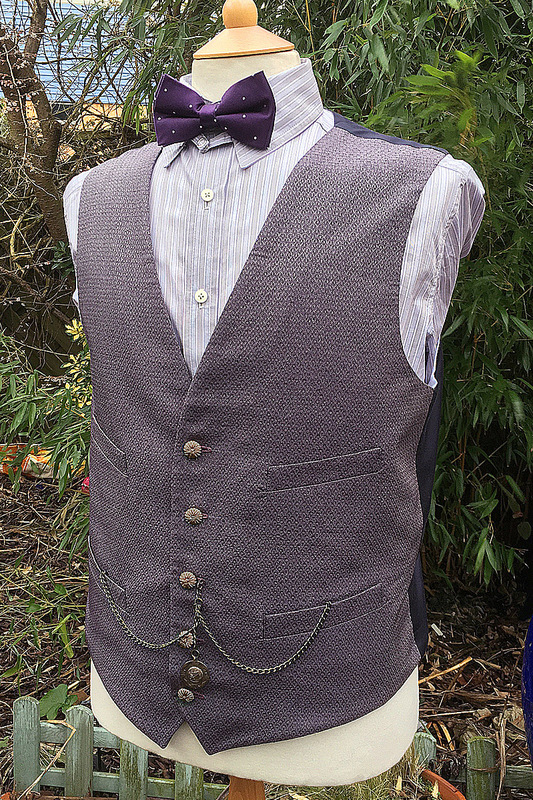 They do a Smith Tweed Jacket (see left) which ticks a lot of boxes with the correct buttoning; pocket styles; elbow patches in a choice of options; and single back vent. 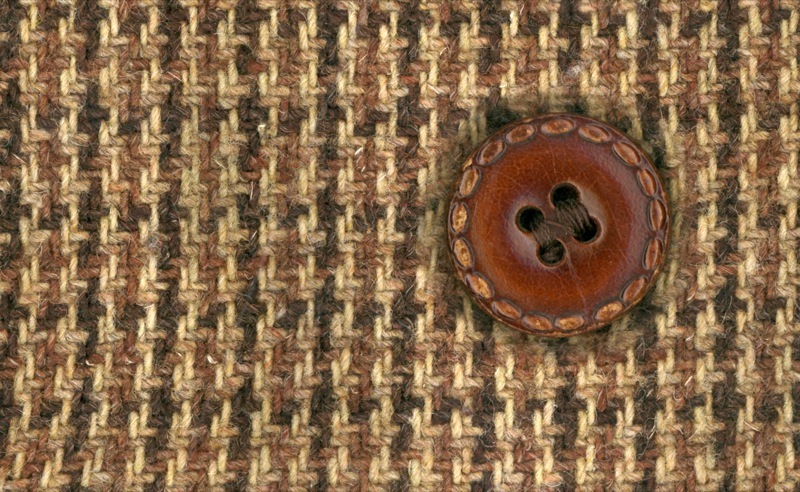 The fabric, however, is not a genuine Harris Tweed, being a good alternative but so is a compromise. It is priced at US$395, with a surcharge of between $60 and $75 for leather elbow patch options, making a top price of US$470, equalling a hefty GB£325, so is a more pricey option given that it is far from accurate. After a few weeks filming, Matt was suddenly spotted wearing a different jacket, this time in a flecked, solid colour. This is a Donegal & Shetland Tweed. No reason or explanation has been given for the change of costume between episodes, in the same way he has changed from a burgundy Paul Smith shirt to a blue one – which is very odd, since he seemed to chance-find the shirt at the end of The Eleventh Hour. Given the difficulty the rest of us have had trying to find those shirts, it’s a wonder he got another! I’d like to know where he got it!!!! The new jacket again has a two button closure, this time with shanked woven leather buttons; two outside pockets and a single vent at the back; as well as the usual elbow patches. This jacket is worn in: The Eleventh Hour, The Beast Below, Vampires Of Venice, Amy’s Choice, The Hungry Earth, Cold Blood, The Lodger, The Pandorica Opens and The Big Bang. I have wondered if the change of jacket and the episodes it is seen in has all been a massive continuity mess-up. 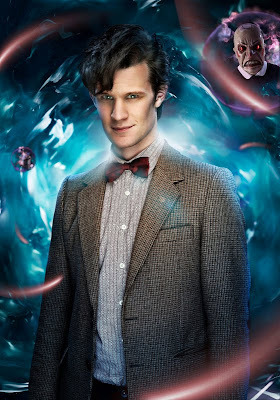 In the first story to be shot, The Doctor looses his jacket so he can make is escape from one of the Weeping Angels. IF Matt wore the Harris Tweed jacket in The Eleventh Hour and The Beast Below it would make sense as he would be in the same jacket from the start, before needed a new one after Flesh And Stone. This one is slightly harder to readily find, but there is now a new, and exciting option, but more on that later. So far I have not personally seen a decent match for the Donegal version on eBay. That’s not to say it doesn’t exist, but it has come to light recently that this jacket was custom made to a classic pattern using the Donegal Tweed. This means that the jacket was not a vintage find and I wonder if the fabric had been used widely enough for this purpose for anyone to find such a jacket now. One option is getting a jacket made to measure. Thanks to a reader of my blog, I have been given a link to a site where you can get a custom-made jacket using what looks like a good match to the Donegal flecked fabric. 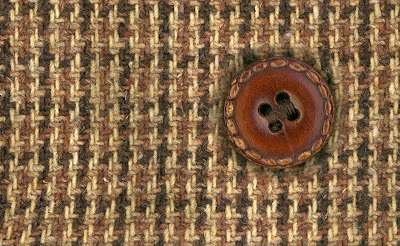 tweed-jackets-uk.co.uk has a special section for Tweed jackets in Donegal & Shetland fabrics. The fabric you want is AHD 05 (see left). You’d then need to choose your size; your fitting length; the buttoning - select Two; the pocket options - select Straight Pockets; select No for the Ticket Pocket Option; and finally Centre Vent for the Vent option (see right). 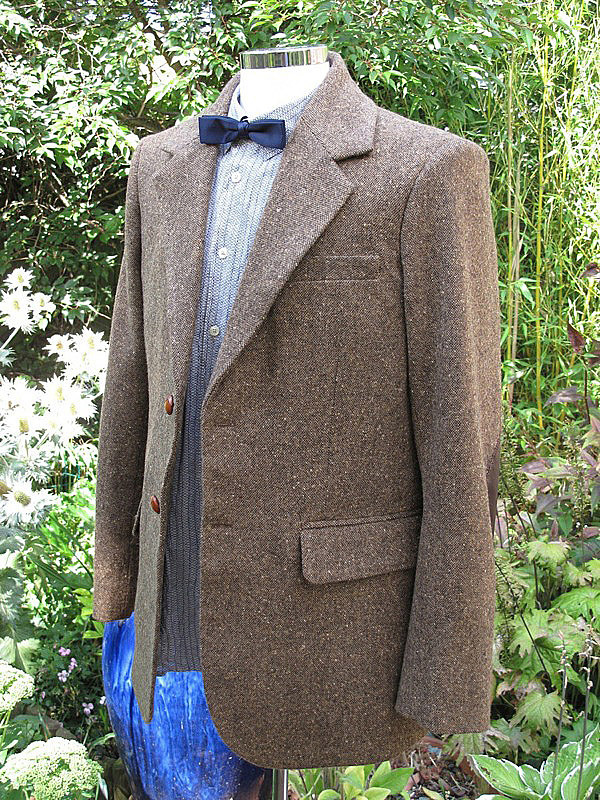 The jacket costs a little under £200, but it is then a genuine Tweed jacket, made-to-measure. The 2010 Christmas Special, A Christmas Carol, saw the return of Barbara Kidd as costume designer, taking over from Ray Holman. Barbara Kidd work on the Jon Pertwee era from 1973 to 1975, and returned previously to work on Kinda with Peter Davison. The basic look of Matt’s costume remained, but the individual elements was all revised and rebooted – most notably his jacket. This new jacket is a bit more tailored and designed, with a three button closure, higher set lapels and distinctive striped tweed fabric. Strangely it lacked elbow patches, but these were added prior to the full Season Six opener, The Impossible Astronaut. Since this jacket was custom made, it is near impossible to find a perfect match for it on eBay or the like. However, some people have found pretty good jackets that are similar in style and pattern, though I think the cut with the higher lapels over-rides find the perfect fabric. Luckily in late April 2011 Abby Shot announced they were to release an officially licensed replica of the Season Six jacket. Some reports suggest an August availability, but others say late October, so it is unclear when it will on sale. No images have as yet emerged of their version, but the publicity text states it will be a wool/acrylic mix, which suggests it will not be made from screen accurate Tweed, as this is 100% wool. 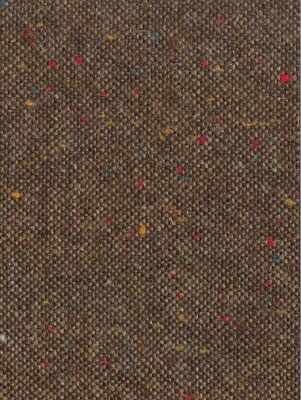 The biggest news, however, regarding the new jacket was the discovery of the original supplier of the Shetland Tweed fabric used! It is possible to buy the fabric from W Bill, but it is very expensive, costing around £60 a metre! Alternatively, if you want a Season Six jacket made-to-measure using THE Shetland Tweed, I can make one hand-tailored (see left). I have researched the pattern extensively and tracked down the perfect elbow patches and buttons to finish off the job! You may also find some of the following links useful when searching for a Tweed Jacket, and knowing your stuff before asking for one. 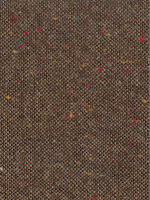 If you spot any good sources of Tweed Jackets, drop me a line and I can add it to the list. Email me a line at tennantcoat@me.com so I can amend my information. 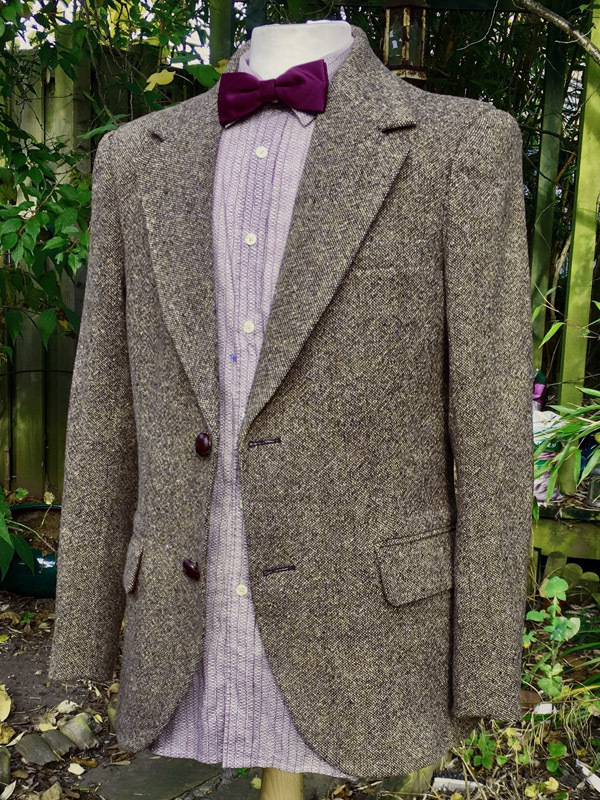 It might be worth noting that what with the popularity of Doctor Who, a lot of people are now listing their tweed jackets with "Dr Who" or "Doctor Who" in the title. Searching something just as "Doctor Who Tweed" is enough to bring a bunch of good looking jackets too. Some of which in smaller sizes too. 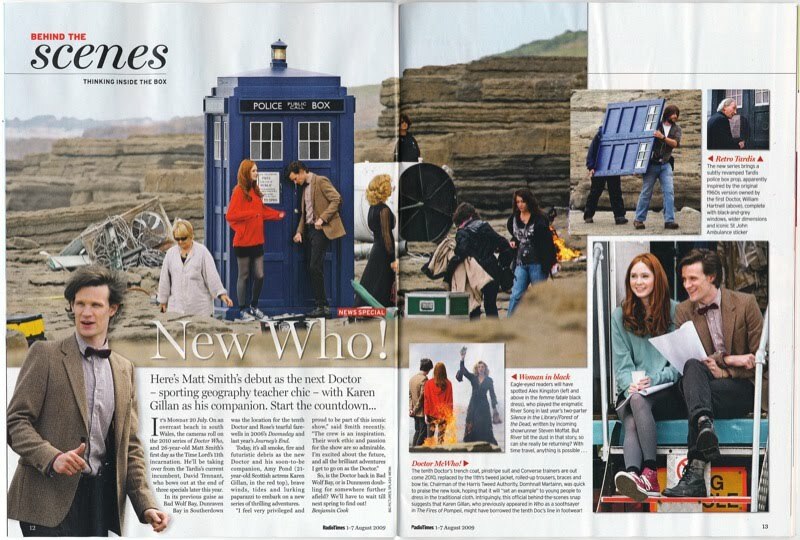 Prepare for more research: Matt Smith has been spotted on set of the Christmas Special wearing a new jacket! Note the lack of elbow patches and previously unseen pattern - any ideas? My 9 year old son wants 11th doctor braces but I can't see them in any photos so don't know what colour to get. He thinks they are navy blue. Any ideas? He has only one, and they are red. 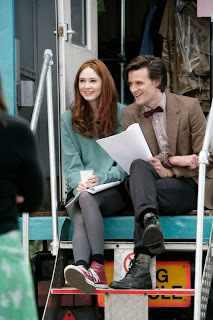 The braces are matched to the shirts The Doctor wears - burgundy and blue. Though they may be a little big for a 9 year old. I'd suggest the wonders of eBay if you want to find child sizes! People say that Matt Smith actually owns the tweed jacket he wears on the show. Which one of these is that jacket? 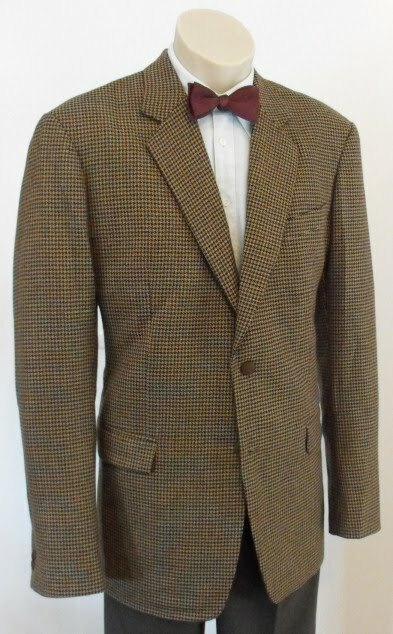 I just purchased a vintage Harris Tweed jacket on ebay for $51, and it looks great! Very minimal minor wear on the inside lining. Fantastic garment. It's a size 46L and fits me like a glove! It has 2 buttons in the front, but the pattern looks very much like the Shetland Tweed pattern. I have to thank you so much for your amazing detail in all The Dcotor's costumes. Your site is a fantastic resouce, and a lot of fun too!